Expand platform services and common framework for document management to offer enterprise-wide functionality for records management, search, workflows, portals, personalized sites, and more. 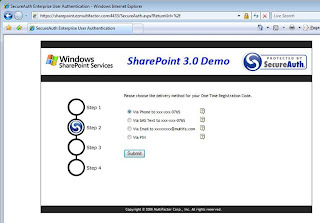 MultiFactor SecureAuth is designed to work with the data connector and authentication components native to the Microsoft SharePoint installation. 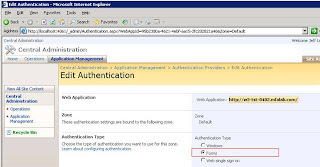 Unique for an X.509v3 authentication product, SecureAuth® can utilize the native ASP.NET forms based authentication, thus greatly simplifying the integration for the SharePoint administrator. (See Figure 2). 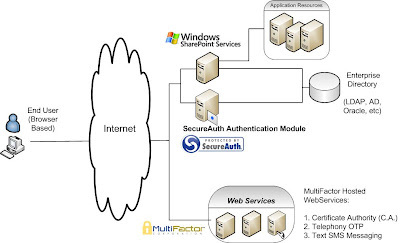 Using a combination of a web server module and web services, SecureAuth provides a turnkey solution to deliver an algorithmically proven method to thwart man-in-the-middle and phishing attacks (See Figure 1). The SecureAuth solution features out-of-band self-registration that automatically delivers X.509 certificates seamlessly to end-users (See Figure 3). The solution eliminates the need for administrator resources to deploy software, install upgrades, or train end-users on complex, remote access procedures.